Johann Sebastian Bach was a German composer (1685-1750) and an accomplished organist, harpsichordist, violist, and violinist of the Baroque period. He was born into a family of influential musicians and held numerous important musical positions in Europe. 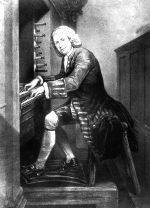 Bach was not widely recognized for his compositions during his time, but during the late 18th and early 19th centuries, he became widely recognized for his keyboard works. Mozart, Beethoven, Chopin, Robert Schumann, and Mendelssohn were among his many prominent admirers. Beethoven described him as "the original father of harmony." Today his music is revered for its intellectual depth, technical command, and artistic beauty.